EarthCam new headquarters location - an expansive and technology-driven 10-acre campus in Northern New Jersey. EarthCam is the global leader in providing webcam content, technology and services. Founded in 1996, EarthCam exists to encourage exploration, foster discovery and connect people through innovative live camera technology. EarthCam.com, the global network of owned and operated live streaming webcams, was built as a way to transport people to interesting and unique locations around the world that may be difficult or impossible to experience in person. Providing a virtual window to the world, viewers can freely explore the globe from unparalleled vantage points, such as the torch balcony of the Statue of Liberty, which has been closed to the public since 1916. 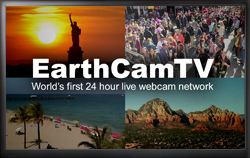 EarthCam.com derives revenue from advertising and licensing of its proprietary webcam content. The Webby & Telly Award winning company hosts many highly trafficked tourism cams, with views of popular locations and landmarks such as Times Square, Eiffel Tower, World Trade Center, Abbey Road Crossing, Statue of Liberty, Las Vegas, the Palm Dubai, Bourbon Street, Washington Monument, Niagara Falls, Andy Warhol's gravesite, Hollywood Boulevard, Miami Beach and Petra in Jordan, a famous archeological site inhabited since prehistoric times and dated to around 300 B.C. EarthCam.net provides webcam technology and managed services consisting of live streaming video, time-lapse cameras and photography documentation for corporate clients and government agencies in major cities around the world. EarthCam systems meet the demands of projects of all sizes with the largest selection of reliable hardware powered by proven easy-to-use software that empowers our customers to manage jobsites remotely, document compliance and generate positive public relations. With applications in the construction, education, transportation and entertainment industries, EarthCam leads the industry with the highest resolution cameras available to document projects from the space, air and ground, including the world's first outdoor gigapixel panorama camera system. This patent-pending technology delivers superior billion pixel clarity for monitoring and archiving important projects and events across the globe. EarthCam also provides the industry with innovative UAV and aerial imagery services. EarthCam Air combines EarthCam's powerful webcam technology with UAV services, cloud-based storage solutions and distribution tools. EarthCam has developed a geospatial mapping platform, resulting in a comprehensive analytical report with countless benefits. In 2015, EarthCam documented $221 billion of construction projects. Every day smart organizations are utilizing EarthCam to engage customers, highlight accomplishments and promote innovation. Projects documented by EarthCam include: 9/11 Memorial Museum, Atlanta Falcons' Mercedes-Benz Stadium, Barclays Center, Statue of Liberty and Washington Monument Restorations, New NY Bridge, LaGuardia Airport, The Kingdom Tower, Panama Canal Expansion, Smithsonian Institution Restoration, Brickell City Centre, Minnesota Vikings' U.S. Bank Stadium, San Diego New Central Library, Qatar Rail, Whitney Museum of American Art, Louvre in Abu Dhabi, Levi's Stadium and National Museum of African American History and Culture. EarthCamTV and ConstructionCamTV are EarthCam's 24-hour live streaming channels featuring unique webcam content in a programmed lineup. EarthCamTV features the best views from the webcam network's collection of global cameras, where living digital wallpaper seamlessly transitions from one picture postcard view to the next. ConstructionCamTV is devoted to a global network of live construction cameras and educational time-lapse movies. Viewers are transported to projects including leading medical centers, major league stadiums, sophisticated skyscrapers and complex bridges. Both channels are actively monitored and programmed to feature the best content at the optimal times. EarthCamTV is now available on Sony devices and is one of the premiere apps on the new Apple TV.